When I drive on the Long Island Expressway — often referred to as the world’s longest parking lot — I imagine commuter rail lines running down the median, an extension of the New York City subway system. When I drive on the West Side Highway, I imagine a wide stretch of green parkland along the riverside, easily accessible to the public on foot or bicycle. When I walk around Wall Street, I imagine a great bridge linking Lower Manhattan with Brooklyn. Each of these visions come from having recently read The Power Broker: Robert Moses and the Fall of New York, the biography of master builder Robert Moses, written by Robert Caro in 1974. It is rare that a single book can forever change the way you see your surroundings — in this case New York City and vicinity. This is such a book. And it is more timely than ever, as cities struggle to reimagine themselves as green spaces, less dependent on automobiles. Robert Moses became involved in New York City politics in the 1920s and was a pivotal figure in New York until he was pushed out of power in the late ’60s. Throughout that time, his office was a shadow government, and in many areas he amassed greater power and resources than the mayor of the city. The son of a wealthy Jewish family, Moses inherited an interest in public service from his mother, who worked with settlement houses that assisted new immigrants. He rose in unelected city positions, building hundreds of new parks and winning over the enthusiastic support of the public and the press. He worked without pay, in stark contrast to the widespread corruption in city government at that time. With growing power and ingenuity, he constructed parkways from Manhattan to Eastern Long Island, and built Jones Beach State Park, a welcome escape for city dwellers — at least those with cars, since he intentionally built overpasses too low to allow buses to reach the beaches. As he amassed greater power, he planned bridges and highways throughout the metropolitan area, bulldozing stable working class neighborhoods along the way. He figured out how to use tolls from his bridges to pay for his highway projects, at a time when the City’s coffers were empty. Before Moses, tolls were only charged until the cost of the bridges had been recovered. During Moses’ reign, bridges became his personal ATM. One of Robert Moses’ earliest goals was to develop the dilapidated West Side of Manhattan. He succeeded in creating a highway and new parkland, but he ignored the suggestion to set the highway back and to reserve the riverside for the public, leaving the best views of the Hudson River to drivers. Later, Moses built the Long Island Expressway, ignoring calls from younger urban planners to include a rail line, which would not have added significantly to the cost. Mass transit would have promoted dense development along the center of Long Island, placing apartments and businesses within easy reach of the central artery by foot, bicycle, or regional public transportation. But Moses didn’t want business and industry on Long Island, preferring instead that Long Island remain a playground for the well off, accessible only by automotive. Moses also wanted to build a bridge connecting Lower Manhattan with Brooklyn, even though a tunnel would be less expensive. The elevated roadway that was to connect the bridge on the East Side to the West Side Highway would have thrown Battery Park into shadow and ruined the commanding views of New York Harbor and the Statue of Liberty enjoyed by the titans of finance and industry working on Wall Street. Moses was accustomed to bulldozing working class neighborhoods for his projects. Here, however, he met his match, and the bridge was never built. The Power Broker is not just a story about New York City. 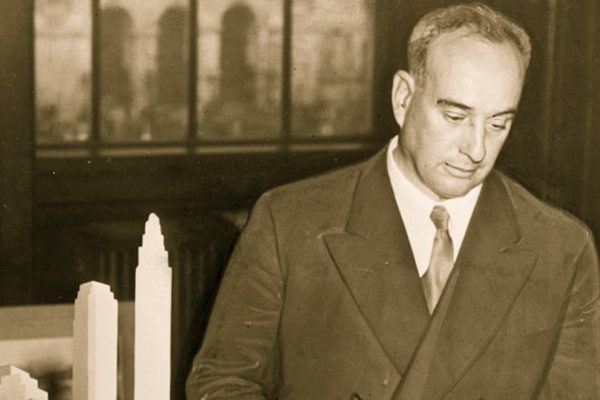 For much of his career, Robert Moses was so revered that urban planners worldwide visited New York to study his works. New York City became the template for mid-20th Century urban development worldwide. Today, as urban planners and environmentalists work to promote mass transit and walkable cities, it is more important than ever to understand how our cities came to be held hostage by the automobile. It is a cautionary tale of epic proportions, a biography of a titanic modern figure. A must read. Photo Credit: Public domain pic of Robert Moses by C.M. Stieglitz, World-Telegram staff photographer (Library of Congress: New York World-Telegram & Sun Collection). drive to get his projects completed despite what he considered obstacles.